1. 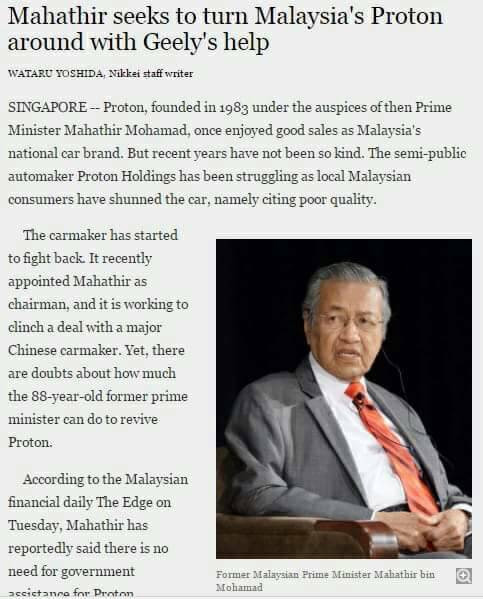 Proton sales started to decline in the year 2003 while Tun Mahathir was still Prime Minister. Just two years later in 2005, it was overtaken by Perodua in the Malaysia market and overtaken by Honda in 2016. Exports sales to UK and Singapore have now dropped to zero. In Australia, from Jan to April 2017, Proton only managed to sell 11 cars. 2. 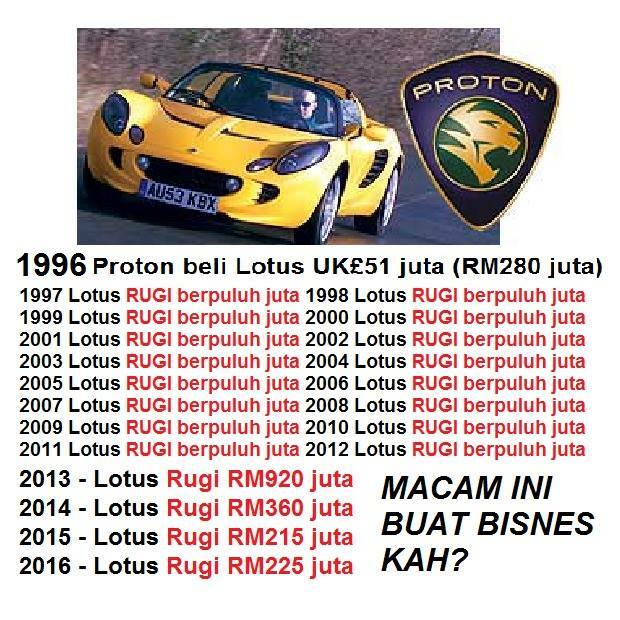 Lotus Cars have lost money every single year since Proton bought the company in 1996 – losing a total of an estimated RM6 billion over the past 20 years and RM920 million in 2013 alone. 3. 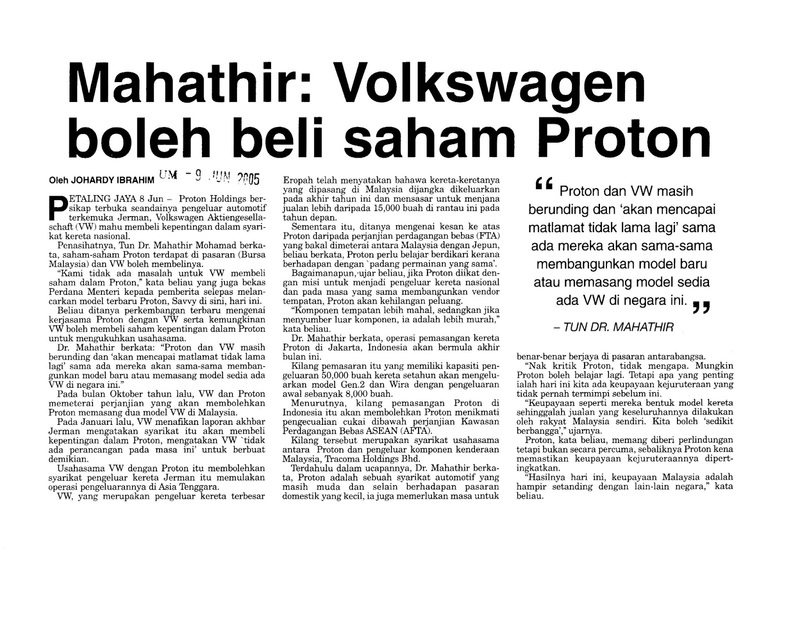 Tun Mahathir had asked Volkswagen to take a 50% stake in Proton in the year 2005 but the deal did not happen. 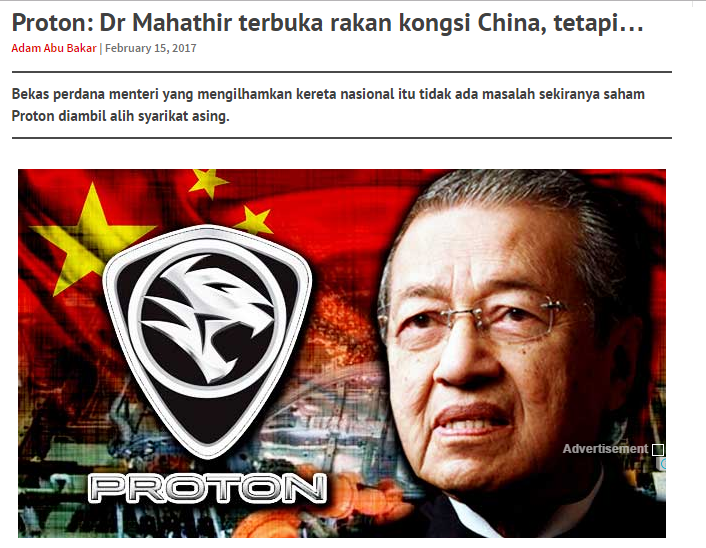 Later, Tun Mahathir asked the government to sell all of Proton to DRB-Hicom in 2011. 4. Since DRB-Hicom fully took over in 2012, Proton have lost RM4 billion. In the year 2016 alone, Proton lost RM1.4 billion. Proon had also dragged the parent DRB-Hicom group into losses – putting 100,000 jobs at risk. 5. The heavy losses and lack of cash in Proton also caused payments to Proton suppliers and vendors to be unpaid – putting another 40,000 jobs at risk. 6. Due to the big amount of jobs at risk, the govt had no choice but to give RM1.5 billion in soft loans to Proton in early 2016 which Proton immediately used up to clear off all its debt to its suppliers and vendors. In late 2016, the govt was also forced to give another RM1.7 billion in credit line to Proton to enable it to continue operating. 7. The total assistance given by Govt to Proton in 2016 alone is RM3.2 billion – This is more than half of the RM5.9 billion that the govt paid in BR1M to 4.7 million households and 2.7 million single individuals for the year 2016. This would be on top of the RM14 billion assistance that the govt had given Proton since it was founded. 8. After being made Chairman of Proton in Jan 2014, it was Mahathir and Tan Sri Syed Mokhtar who traveled to China in April 2014 to invite Geely to help save Proton. It was Mahathir who first approached Geely for help. The Govt no longer owns Proton. The sale to Geely was DRB Hicom’s decision – not the govt. As pointed out earlier, it was Mahathir who had asked Govt to sell its stake in Proton to DRB Hicom, a private company, which then sold a stake to Geely. Therefore, it is strange for Mahathir to suddenly criticize the sale of a stake in Proton to China’s Geely and claim he is crying since it was Mahathir who first said that Proton should sell a stake to Germany’s Volkswagen in 2005, it was Mahathir who asked Government to sell all its stake in Proton to a private company in 2011 and it was Mahathir who first approached Geely in China in 2014 to ask it to help save Proton. In fact, just 3 months ago in February 2017, Mahathir said he has no objection with Geely buying a stake in Proton. Suddenly, 3 months later he criticizes the government, blames Najib and he says he wants to cry because his “son” was sold? Looks more like Mahathir was the one who sold his own son instead. Bapak jual anak! 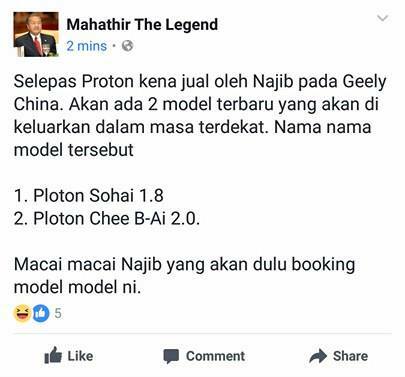 Even though Mahathir was instrumental in the govt selling off Proton to private companies and in getting Geely to be interested in Proton, this has not stopped Mahathir from going all over Malaysia during the month of Ramadhan to slander and blame Prime Minister Najib over Proton’s sale and make low-classed jokes about Najib’s wife. This is from two days before Ramadhan started. Of course, Mahathir supporters and fan-pages take their cue from his low-class jibes and proceeds to hit even lower lows with posts such as this – on the first day of Ramadhan too. 9. Proton continues to be 50.1% majority-owned by DRB-Hicom, a Malaysian company while Geely owns 49.9%. Geely has a good track-record. After buying 100% of Volvo from Sweden in 2010, Geely has helped make Volvo a success. Last year, Volvo sold the highest number of cars in its history – it’s fourth straight years of record sales. 10. By partnering with Geely, Proton’s survival is more assured. Instead of a market of just 30 million people in Malaysia, Proton can now access a market of 1.4 billion people in China. It is better for Malaysia to own 50.1% of a company that has chance to survive and have a market of 1.43 billion people than to own 100% of a company that is on the verge of bankruptcy and losing billions of Ringgit every year in a market of just 30 million people.